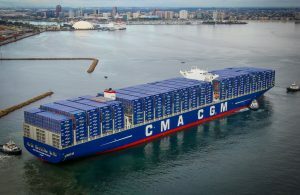 According to analysts at Alphaliner, the newbuilds recently ordered by MSC and CMA CGM could result in a larger capacity than the initially announced 22,000 TEU, reports The Loadstar. 9 vessels, which China State Shipbuilding Corporation will build for CMA CGM with delivery in 2020, and 11 vessels, which MSC ordered to Korea’s Samsung Heavy Industries and Daewoo Shipbuilding and Marine Engineering with delivery in 2019, can ultimately have the capacity of 23,500 TEU, ushering in a new era of the megamax containership. The Alphaliner analysts say that the order specifications from both shipping lines include options to enlarge the vessels by extending their breadth to accommodate a 24th row of containers on deck. With the length of 402m, which is similar to that of Maersk’s Triple-E class ships, the newbuilds can be widened to 61.4 metres. Thus, these next-generation ships will have a length of 24 container bays, a breadth of 24 deck rows and a height of 24 container tiers: 12 in the holds and up to 12 on deck, hence the name given by Alphaliner to this new type of ships – Megamax-24 (MGX-24). Earlier, Alphaliner has also foreseen the Megamax-23 (MGX-23) ship as one with 24 bays in length and 23 container rows in breadth. These vessels have a length of 400m and a beam of around 59m with a capacity of 18,000-21,000 TEU. It is worth noting that CMA CGM and MSC decided to go different ways with regards to the propulsion of their newbuilds. MSC has opted for an exhaust scrubber solution to comply with the 0.5% sulphur cap regulations coming in 2020, whereas CMA CGM will equip its vessels with engines using LNG, thus becoming the first shipping company in the world to equip giant containerships with this type of motorization, as the company said in its statement on Tuesday. The Loadstar informs that UASC was the first carrier to order LNG-ready ULCVs back in 2014, when bunker prices reached USD 600 per tonne, but with the subsequent slump in oil prices the LNG option was removed from newbuild specifications. Apart from the reduced bunkering locations for LNG-powered vessels, another factor that has deterred carriers from this propulsion option was the necessity to sacrifice a number of container slots in order to house the gas tanks. According to Alphaliner’s model, a typical MGX-24 containership would need to allocate around half of one hold, or some 500 TEU of paid cargo slots, to house the LNG tanks. However, with increasingly tough emission restrictions on their way and the recent surge in oil prices, shipowners are now reinvestigating alternative propulsion options.